Are you being charged, in Palm Beach County, Florida with Drug Trafficking? Need a drug trafficking defense attorney in West Palm Beach, Boca Raton, Jupiter, Palm Beach Gardens or Boynton Beach? We are Drug Trafficking defense attorneys located in West Palm Beach. When you are arrested for illegal drugs, it is important to hire a Criminal lawyer that understands and practices in the area of drug crimes and criminal defense law. Don’t hire a lawyer that dabbles in criminal defense; hire a criminal defense attorney that has extensive experience in defending Drug Trafficking charges. Your drug crime or drug offense lawyer needs to have knowledge and experience in drug cases but also needs to know the prosecutors, judges and court staff. Knowing the players comes from years of being inside the courtroom. Finding the best criminal defense attorney in Palm Beach County, for your case, is difficult. You need to review their educational background, experience in criminal cases, their reputation in the community, and their ability to communicate with you, the client. The quality of the criminal defense attorney you hire to defend your drug trafficking case is extremely important. We ask that you consider our South Florida Drug Trafficking Defense Attorneys. Attorney Roger P. Foley has offices in Broward County, Fort Lauderdale, and in West Palm Beach. Mr. Foley has defended hundreds of individuals charged with drug crimes; Possession of drugs, possession of drug paraphernalia, Sell, deliver, manufacturing of drugs, cultivation of drugs, marijuana grow house charges, and drug trafficking charges. Palm Beach Gardens drug trafficking defense lawyers, Royal Palm Beach drug trafficking defense attorneys, Delray drug trafficking defense attorneys are available now to defend your case. We have defended individuals charged with drug trafficking crimes in Lake Worth, Riviera Beach, North Palm Beach, Wellington and Juno Beach. Possessing, manufacturing, selling, transporting drugs is illegal in Florida. Drug trafficking is different from that crime because trafficking involves large quantities of drugs. Drug traffickers are the suppliers for the drug dealers and they need a lot of inventory. Drug trafficking is selling, purchasing, manufacturing, delivering, bringing into Florida, or possessing any controlled substances in amounts over the amounts defined in Florida Statute 893.135. Each drug has a different amount because not all drugs are equal. Section 893.03 lists the controlled substances in schedules. The substances that are listed in the five schedules are listed according to their potential for abuse and their medical use. Schedule I drugs have the highest potential for abuse with no medical use and Schedule V drugs have the lowest potential for abuse with medical use. The reason the drugs are put into schedules is because the statute listing the crime can simply refer to the schedule instead of a huge list of drugs. It is not illegal to possess certain schedule drugs if you have a prescription. There are many drugs that can be trafficked. Below will be briefly discussed the more common drugs that are trafficked. This paragraph applies when a person sells, purchases, manufactures, delivers, brings into Florida, or possesses more than 25 pounds of cannabis or more than 300 cannabis plants. The punishment depends on how many pounds or plants the defendant has. Trafficking 26 pounds to 1,999 pounds or 201 plants to 1,999 plants is charged as a first-degree felony with a minimum mandatory sentence of three years and a $25,000 fine. Trafficking 2,000 pounds or more, but less than 10,000 pounds, or 2,000 or more cannabis plants, but not more than 10,000 cannabis plants, is a mandatory minimum sentence of 7 years, and the a fine of $50,000. Trafficking 10,000 pounds or more or 10,000 or more cannabis plants, is a mandatory minimum term of 15 years in prison and a fine of $200,000. This paragraph applies when a person sells, purchases, manufactures, delivers, brings into Florida, or possesses 28 grams or more of cocaine or any mixture containing cocaine. Trafficking 28 grams or more, but less than 200 grams, results in the defendant being sentenced to a mandatory minimum term of imprisonment of 3 years and a fine of $50,000. Trafficking 200 grams or more, but less than 400 grams, results in the defendant being sentenced to a mandatory minimum term of imprisonment of 7 years and a fine of $100,000. Trafficking 400 grams or more, but less than 150 kilograms, results in the defendant being sentenced to a mandatory minimum term of imprisonment of 15 calendar years and a fine of $250,000. If the trafficking is 150 kilograms or more, the crime is a life felony. If someone traffics 150 kilograms or more and someone is killed, it is a capital felony. If the defendant traffics 300 kilograms of cocaine, it is a capital felony. This paragraph applies when a person sells, purchases, manufactures, delivers, brings into Florida, or possesses morphine, opium, hydromorphone, hydrocodone, or heroin. This area has punishments that range anywhere between first-degree felonies with 3 year minimum mandatory sentences with $50,000 fines all the way up to the capital felonies with a $750,000 fine. The punishment depends on the drug, the amount, and if anyone was killed. This paragraph applies when a person sells, purchases, manufactures, delivers, brings into Florida, or possesses 28 grams or more of phencyclidine or any mixture containing phencyclidine. Trafficking 800 grams or more and the defendant knows that the probable result of such importation would be the death of any person, the defendant commits capital felony with a $250,000 fine. This paragraph applies when a person sells, purchases, manufactures, delivers, brings into Florida, or possesses 200 grams or more of methaqualone or any mixture containing methaqualone. Trafficking 200 grams or more, but less than 5 kilograms, results in the defendant being sentenced to a mandatory minimum term of imprisonment of 3 years and a fine of $50,000. Trafficking 5 kilograms or more, but less than 25 kilograms, results in the defendant being sentenced to a mandatory minimum term of imprisonment of 7 years and a fine of $100,000. Trafficking 25 kilograms or more, results in the defendant being sentenced to a mandatory minimum term of imprisonment of 15 calendar years and a fine of $250,000. Trafficking 50 kilograms or more and the defendant knows that the probable result of such importation would be the death of any person, the defendant commits capital felony with a $250,000 fine. To be convicted for trafficking under any of these sub-sections, it is basically same three elements except you switch out the illegal drug and the threshold amount. If this is proven, the prosecutor can then move on to prove if the defendant trafficked in a certain amount to enhance the penalty from the basic trafficking punishment. (3) The controlled substance weighed over the threshold amount for the specific drug. One of the major areas that criminal defense attorneys defend is the justification for the stop, arrest, or warrant. Drugs that are being trafficked are not just out in the open but are in a building, truck, trailer, camper, etc. The police can search these areas if they have a warrant or some other warrant exception such as an emergency, search incident to arrest, inventory searches prior to impounding, etc. If the stop, arrest, or warrant were done in violation of the Fourth Amendment, the evidence will be suppressed. Our Boca Raton Drug Trafficking Lawyers will also make sure that law enforcement properly tested the drugs and did not over inflate the amount of the drugs. “[T]o establish beyond a reasonable doubt that individually wrapped packets of white powder meet the statutory threshold for weight in trafficking prosecutions, the State must chemically prove that each individually wrapped packet contains at least a mixture of a controlled substance before it may combine the contents and determine whether those contents meet the statutory threshold for weight.” Greenwade v. State, 124 So. 3d 215, 229 (Fla. 2013). If you or a loved one have been arrested and charged with drug trafficking, call our law offices to schedule a free consultation. We need to hear your version of the story so we can craft a defense strategy to your case. We will take depositions of the officers involved and request evidence from the prosecutor to see what evidence they have against you. After reviewing the evidence, we will present to you your options: we can take the case to trial, negotiate a plea deal, or negotiate that the case be dropped. Not all cases can be dropped, dismissed, or acquitted; sometimes the facts and evidence are against the defendant. 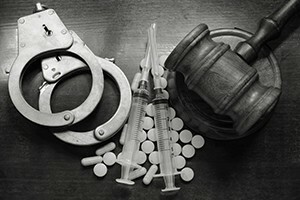 In these situations, our Boca Raton Drug Trafficking Lawyers will continue to keep on fighting to get you the best result possible to your case by creating a mitigation package which we will present to the prosecutor and judge to persuade them to lessen your sentence.